Since 1998, I’ve been a writer/editor for the United Methodist Church’s Baltimore-Washington regional office, based in Columbia, Md. I write stories and articles for the bimonthly newspaper, the UMConnection, for the Web site, and I am editor and writer of the weekly e-connection, with the primary text on the Web site at www.bwcumc.org/news/e-connection. From 1993-1999, I was senior editor for the now defunct DIVERSITY magazine, a publication on biodiversity that dealt a lot with agricultural research. From 1991-1993, I was co-director of the International Voluntary Services, an overseas development organization that placed volunteers in other countries, primarily Vietnam and Laos, but many others to a lesser degree, which folded in 2003 after almost 50 years. for two years prior to the IVS experience, I was an administrator for a small advocacy group called the Campaign to Oppose the Return of the Khmer Rouge (CORKR), which did its job then closed. In the mid-1980s, while attending Wesley Theological Seminary in Washington, D.C., I worked for the Pax World Foundation at its small office in Bethesda, Md. For 14 of the previous 20 years, I lived overseas as a foreign service wife, in Vietnam from 1962-1965, then in Thailand for eight years. After a six-year stint in the United States, my late husband was posted to Dakar, Senegal, where we remained until his death there in 1981. I was partially employed from time to time as an editor and I did several projects one place or another. In Bangkok I spent the better part of a year doing research and writing on the effects of the sale of Nestle products on poor people, an unpaid job that was field research in support of the Nestle boycott. My work took me into the worst slums of Bangkok (Klong Toey) to interview women. In Thailand I also looked into and published an article comparing treatment for leprosy, including visiting “under-the-tree” clinics and the leprosarium in Chiangmai. My relationship with World Hunger Service began at its beginning when, in the 1970s during the time I was resident in the U.S. 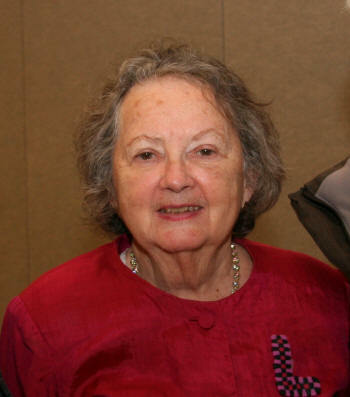 I worked with the founder of WHES, Pat Kutzner, on hunger seminars and publications, including several of the earliest paper editions of Hunger Notes, as well as other publications. I became a member of the Board of Directors sometime in the mid-1980s. During the 1970s, I was also employed for a few years by the Center for Science in the Public Interest. One of my most notable efforts was organizing and holding a seminar on Capitol Hill to look at food and hunger issues, based on the book, Food First,by Frances Moore Lappe. The conference included several congressmen as well as other prominent speakers on various aspects of the issue. I have a Bachelor of Science degree from Kalamazoo College in social work and English; and a Masters of Theology from Wesley Theological Seminary. I did graduate work at Michigan State in anthropology and sociology but went overseas before writing the dissertation. I am the mother of four grown children, most with Masters degrees. I am an active member of a United Methodist Church, hold membership in the United Methodist Association of Communicators and the Religious Communicators Association and am vice president of the International Voluntary Services Alumni Association. I am a member of a league of duckpin bowlers. I have traveled in 35-40 countries, including some not on the usual travel plan: Bangladesh several times, Cuba twice, Cambodia, Burma, Mongolia, Mauritania, and most recently Ecuador and the Galapagos Islands. I have combined travel with work missions in several instances: Jamaica, Russia and Nicaragua.